Miyako moved to Canada from Japan when she was 20 years old. She has always had a strong interest in healing processes. She was raised by her mother, an artistic and spiritual woman, and her father, a successful eye surgeon in Japan. Together, her parents inspired her interests greatly. 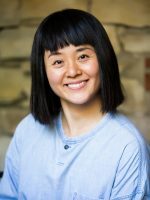 Miyako constantly strives to learn to be a better osteopathic manual practitioner. She travels around the world to further her studies in osteopathy, bringing that knowledge back to Toronto. Her treatment is gentle and light, yet precise and to the point. It brings the gravity force, which runs through our body, to the center as much as possible, to reduce its burden on our structures and systems. It also helps to coordinate and balance the autonomic nervous system and is essential for improving our digestion, respiration, bowel movement, menstrual cycle, hormones, sleeping pattern, and even our emotional and psychological states. Miyako’s treatment is holistic and incorporates the whole body in her manual therapy. She facilitates the healing process across a range of physical issues. Miyako likes to create art, including jewellery; she rides her bicycle everywhere; and enjoys reading in her spare time. Miyako speaks Japanese and English.